Perhaps it is because I just celebrated my birthday, or because of my wedding a few weeks ago, or maybe it’s that my youngest sibling just left for her first year of college, but I find myself being very retrospective lately. Thinking about all that has changed and the twists and turns of life that have brought me to this place. Realizing that the life I’m living is not at all where I thought I would be when I was younger, or even that this moment in time isn’t what I thought it would be like last spring. This realization that things have changed in big and small ways around me and somehow I didn’t notice them, until they hit me all at once. It’s startling to say the least. It’s jarring to realize that one small, seemingly insignificant, moment can be the impetus for a whole host of changes, for better or for worse. Then the what-ifs start creeping in. I don’t fear change, change means we are growing and moving forward in a well lived life, it is the looking back and seeing where I have been, or where I could have been that is at times more than I can comprehend. When I am feeling overwhelmed by the weight of all that is life, I head in to the kitchen. I cream some butter and sugar, or heat some olive oil in a skillet, add some onions and wait for the familiar aroma to fill the kitchen. Food and cooking are constants in an inconstant world. I find it very comforting to know that butter, sugar, flour, vanilla in various amounts will always add up to cookies. From my many hours in the kitchen I have learned exactly what flavor cardamom can add, I know how much salt to add without thinking about it, and I can advert most any ill-fated recipe just by looking at the ingredient list. The subtle confidence feels almost like a dance that has taken me years to learn. I don’t mean to sound cocky or overly confident, because I surely have my fair share of mishaps, but somehow the kitchen has become a living, breathing, organism with which I have a very intimate relationship. We have our spats here and there, but we’ve developed this way of working that is the ultimate comfort. 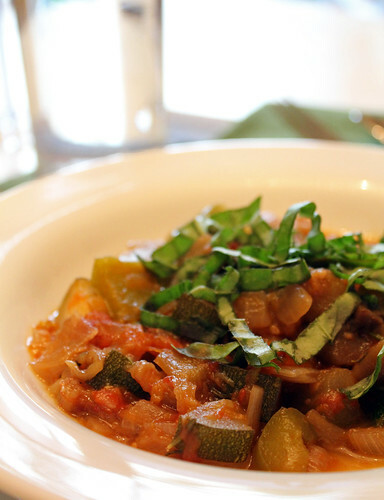 This ratatouille recipe is adapted from the Spanish cookbook 1080 Recipes, it is a great book for inspiration, while the recipes tend to be a little bare bones in nature it gives you a lot of room to adapt and elaborate. Heat the oil in a large, deep skillet. Add the onion and cook over love heat, stirring to avoid browning, about 10 minutes. Add the eggplant and cook, stirring occasionally, for another 10 minutes. Next, add the bell pepper and again cook for 10 minutes, stirring occasionally. Finally add the zucchini, tomato and salt, stir to combine then add the garlic and herb bouquet. Cover and simmer over low heat for 1 hour. If the ratatouille is very soupy you can take them lid off for the last 10 minutes. Remove and discard the garlic and herb bouquet before serving. Season with more salt and pepper to taste. Dish up and top with fresh basil. Ratatouille is best served with a thick hunk of crusty bread. Serves 2 plus lunch leftovers. This entry was posted in Comfort Food, entree, Farm-to-Table, Recipe, Summer, Vegetarian/Vegan and tagged Comfort Food, Farm-to-Table, Recipe, Summer, Vegetarian/Vegan. Bookmark the permalink. Just the other day, someone suggested I make ratatouille and since I’ve never made it before I was intimidated. But this recipe looks so straightforward and comforting, I think I’ll give it a try the next time I run across an eggplant. And maybe a big loaf of bread from The Bread Peddler to top it off. So glad I discovered your blog – it’s beautiful! Welcome! I saw some beautiful eggplants at the Oly farmers market this last weekend, I may have to make it again. 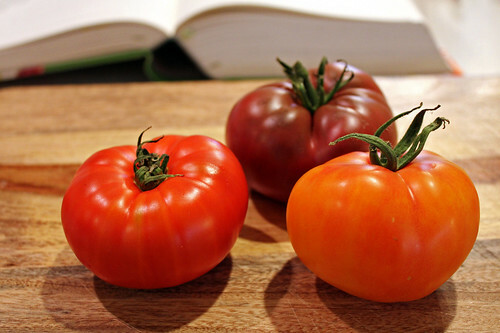 I was holding out for our CSA but I may need to break down and buy one especially for this recipe over the weekend. Yum.